Female priests • Catholic Church does not recognize such ordinations. Steve Griffin | The Salt Lake Tribune Friends, supporters and family members lay their hands on Clare Julian Carbone at the First United Methodist Church in Salt Lake City during her ordination to the priesthood by a group called Association of Roman Catholic Women Priests Sunday, October 18, 2015. The Catholic Church does not recognize such ordinations, but the women priest movement has ordained 220 women since beginning in Germany in 2002. 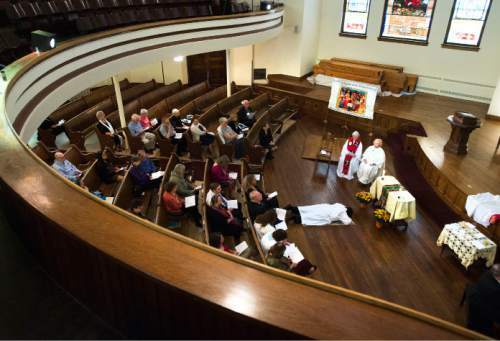 Steve Griffin | The Salt Lake Tribune Clare Julian Carbone lies prostrate at the First United Methodist Church in Salt Lake City during her ordination to the priesthood by a group called Association of Roman Catholic Women Priests Sunday, October 18, 2015. The Catholic Church does not recognize such ordinations, but the women priest movement has ordained 220 women since beginning in Germany in 2002. Steve Griffin | The Salt Lake Tribune Clare Julian Carbone walks through the First United Methodist Church in Salt Lake City during her ordination to the priesthood by a group called Association of Roman Catholic Women Priests, Sunday, October 18, 2015. The Catholic Church does not recognize such ordinations, but the women priest movement has ordained 220 women since beginning in Germany in 2002. 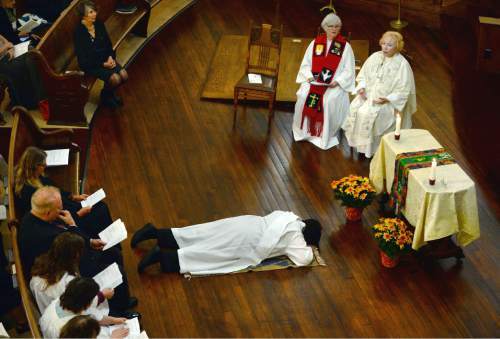 Steve Griffin | The Salt Lake Tribune Clare Julian Carbone lies prostrate at the First United Methodist Church in Salt Lake City during her ordination to the priesthood by Association of Roman Catholic Women Priests, October 18, 2015. The Catholic Church does not recognize such ordinations, but the women priest movement has ordained 220 women since beginning in Germany in 2002. Steve Griffin | The Salt Lake Tribune Friends, supporters and family members lay their hands on Clare Julian Carbone at the First United Methodist Church in Salt Lake City during her ordination to the priesthood by a group called Association of Roman Catholic Women Priests Sunday, October 18, 2015. The Catholic Church does not recognize such ordinations, but the women priest movement has ordained 220 women since beginning in Germany in 2002. 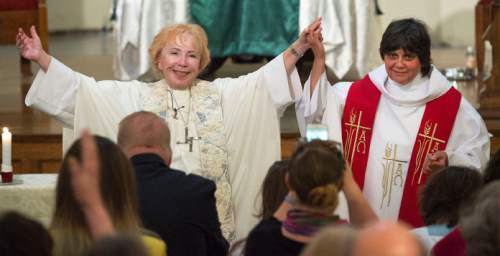 Steve Griffin | The Salt Lake Tribune Bridget Mary Meehan, a bishop with the Association of Roman Catholic Women Priests, left, holds up the arms of Clare Julian Carbone at the First United Methodist Church in Salt Lake City on Sunday, October 18, 2015. Carbone's ordination was a first for Utah. The Catholic Church does not recognize such ordinations, but the women priest movement has ordained 220 women since beginning in Germany in 2002. Steve Griffin | The Salt Lake Tribune Friends, supporters and family members lay their hands on Clare Julian Carbone at the First United Methodist Church in Salt Lake City during her ordination to the priesthood by a group called Association of Roman Catholic Women Priests Sunday, October 18, 2015. The Catholic Church does not recognize such ordinations, but the women priest movement has ordained 220 women since beginning in Germany in 2002. 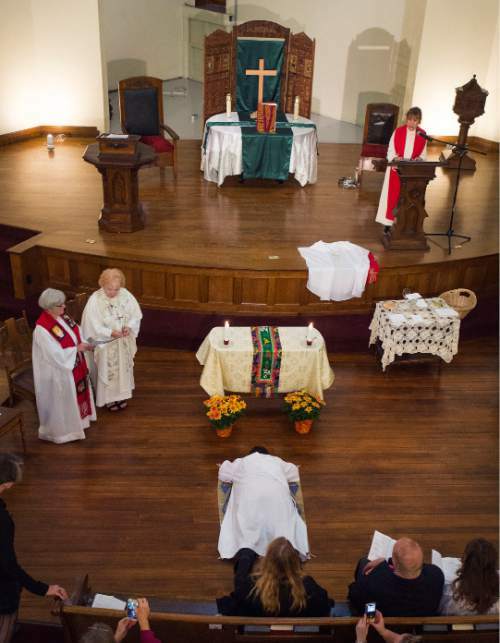 Steve Griffin | The Salt Lake Tribune Clare Julian Carbone lies prostrate at the First United Methodist Church in Salt Lake City during her ordination to the priesthood by a group called Association of Roman Catholic Women Priests, Sunday, October 18, 2015. The Catholic Church does not recognize such ordinations, but the women priest movement has ordained 220 women since beginning in Germany in 2002. 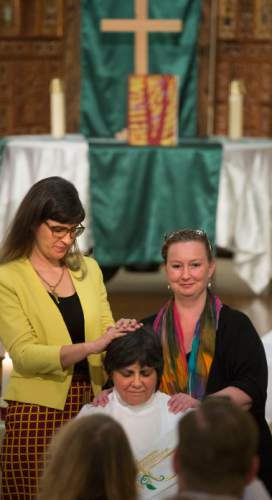 Steve Griffin | The Salt Lake Tribune Kate Kelly and Tara Romney Barber lay their hands on Clare Julian Carbone at the First United Methodist Church in Salt Lake City during her ordination to the priesthood by a group called Association of Roman Catholic Women Priests Sunday, October 18, 2015. The Catholic Church does not recognize such ordinations, but the women priest movement has ordained 220 women since beginning in Germany in 2002. 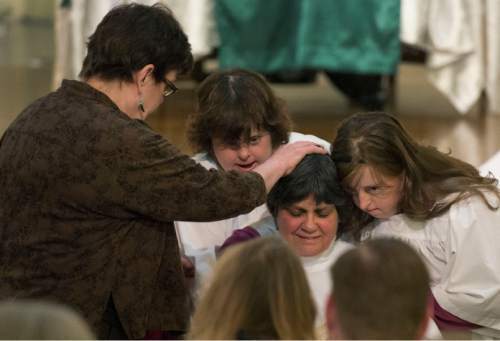 Women who claim their ordinations are recognized by God  if not the Catholic Church  ordained a Salt Lake City woman Sunday, the first woman in Utah to call herself a Catholic priest. Fifty men and women, many of them in Salt Lake City for the Parliament of the World&apos;s Religions, joined in the ordination, taking turns touching Carbone&apos;s head and arms as they prayed silently over her. "We are disobeying an unjust law that discriminates against women in our church," Meehan said in an interview. "Our Roman Catholic women priest movement makes the connection that poverty, violence and abuse of women in the world is related to sexism in the church." Susan Dennin, communications director for the Salt Lake City diocese, said the Catholic Church does not consider the ordination valid and does not condone it. "The Catholic Diocese of Salt Lake City had no prior knowledge of this event and is sad that it is taking place, putting a blemish on the gathering of the Parliament of the World&apos;s Religions," Dennin said in an emailed statement Sunday. The church considers what it calls "attempted ordinations" a sin against the church&apos;s sacrament of holy orders, and regards participants as automatically excommunicated. Pope John Paul II issued an apostolic letter in 1994, saying the church can&apos;t change the choice Jesus made when he picked 12 men as his apostles, men who in turn ordained other men to the priesthood. That hasn&apos;t stopped many Catholics from embracing the notion, however, particularly in the United States. A survey last spring by the Pew Research Center found 59 percent of practicing American Catholics favor female ordination. The Association of Roman Catholic Women Priests and a sister group, Roman Catholic Women Priests, have ordained more than 220 women as deacons and priests, mostly in the United States, since 2002. Meehan said they claim apostolic succession because an ordained  and anonymous  male bishop ordained the first female bishops. But in her homily Sunday, Meehan said Christ also sent out women as apostles, such as Mary Magdalene, the first to witness the resurrected Christ. He sent her to proclaim his resurrection to the others, Meehan said. "There are more than 12 apostles, news flash to the Vatican," she said, prompting laughter. Carbone, 65, who has worked as a licensed clinical social worker and was a contemplative Poor Clare nun for many years, said she does not yet know whether a new faith community will sprout in Salt Lake City as a result of her ordination. She has been invited to celebrate liturgies with other women here, she said. 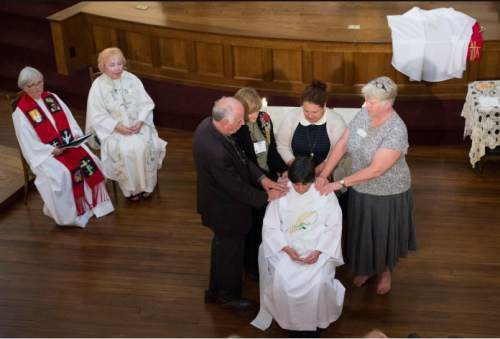 "Many of the women who have been ordained into this movement … their ministries kind of unfold. It&apos;s miraculous, it&apos;s beautiful." She recently became a hospice chaplain, she said. "Part of my priestly ministry will be extended, now, to some of those hospice patients." Kate Kelly, who was excommunicated from The Church of Jesus Christ of Latter-day Saints last year after pushing for female ordination, was among those laying hands on Carbone during the ceremony Sunday. The two embraced afterward. "This was extremely powerful, just to participate as equals with women and feel that solidarity across denominations," Kelly said. 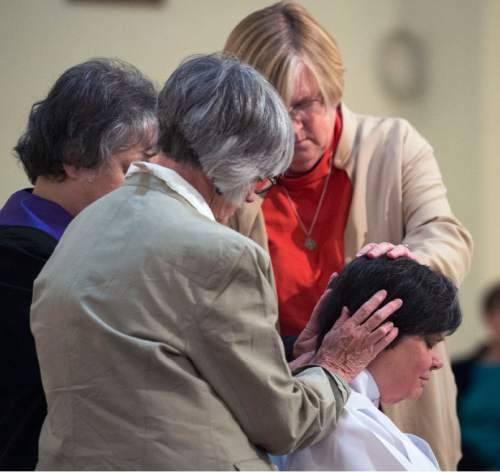 Christina Gringeri of Salt Lake City, a lifelong Catholic, found the ordination beautiful. "I wish more of the local community had been present," she said. In the Catholic tradition, the faithful are thought to possess some fundamental truths of the faith, and in this case, church leaders should follow the lead of the people, she said. "This is a sign of the times. This is a sense of the faithful that they want women to minister," Gringeri said. "We recognize that women are called." But Dennin, the diocese spokeswoman, said it&apos;s the church&apos;s understanding that "ordination does not simply give a man permission to perform the functions of a priest. "It imparts to him an indelible spiritual character that makes him a priest, and since Christ and his apostles chose only men to be priests, only men can validly become priests."